Sending in tax forms to the gubmint. Tassie ran hill repeats with the gang and I on Thursday morning. Today we did a 4 hour brick. Logan is doing well and sleeping more. I am working lots and preparing for the winter camp next week. Managed to watch the Lord of the Rings trilogy this week while conducting evening-daddy -watches-the-baby-time. You can subscribe to our monthly newsletter here. A key workout, sometimes called a breakthrough workout, is a training session in which you are pushing the boundaries of your current ability (raw speed, endurance, lactate threshold (LT), functional threshold power (FTP), race specific pacing). Pushing and testing your limits is a critically important component of improving your total athletic ability. Other components include but are not limited to: Overall endurance and durability, skills development, mental toughness, core/specific strength, body composition, and 'discomfort' tolerance, some of which may be taken on in a key workout session. A key workout does not have to be a super-hard interval session designed to boost your current lactate threshold, however. For a long distance triathlete, a key workout could be an over-distance ride in the buildup to a long distance triathlon. If an athlete has never ridden over 90 miles, riding 120 miles is pushing past that current distance threshold. Once you are out of the early developmental or base building phase of training - the phase where you are just putting some time in to get your body prepared for more specific training - each week of training should include at least one key workout. Younger athletes can generally handle a higher total workload per week, meaning younger athletes can handle more key workouts. Each athlete is different, so plan accordingly. To repeat, the purpose of a key workout is to challenge some current limit on your ability. If you have never run a 5k at 6:00 pace (18:38), a key workout could be 3 x 1 miles at 5:55-6:00 pace with 1 minute or less rest between. This trains your body to hold the goal pace with minimal rest between intervals. You may see this penned as a race specific preparation session. In the swimming world we call this a 'broken' swim. An example would be doing 4 x 50 at your goal 200 pace with just 5-10 seconds rest. So if you wanted to swim a 2:20 200, you would hold :35 or faster per 50 with just a few seconds rest. If your current cycling lactate threshold heart rate is 160 or FTP 250, you could do 15-25 minutes total of intervals at an effort level higher than this. (Less experienced athletes should do less total interval times when starting out.) An example is 6 x 3 minutes at over-threshold with 2-3 minute easy spinning between. While one session is not going to boost the number immediately, consistent and persistent returns to that level will. Once you have nearly maximized this level then you are working on maintaining it, which is just as important from a performance standpoint. A long distance athlete will need to consistently attack their endurance ability limiters. We all deal with bio-mechanical fatigue at some point (where your body just no longer responds as well). If you grow tired after 2 hours riding at a steady aerobic pace, and your race includes 5-6 hours of riding, you need to improve that ability. So your key sessions are going to include a lot of long rides - 2.5 hours, then 3 hours, and so on. Typically, you will want an easy or an off day after a key workout. This depends on your total training volume, your ability to recover, and other factors, but if in doubt, take it easy. Your body needs to rebuild and refuel in a deeper fashion after key training sessions like we're discussing. You can read more in-depth thoughts on training processes on the article page of our website. 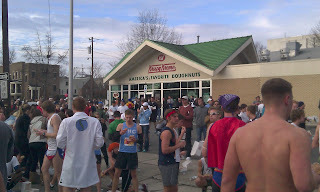 Last weekend I participated in the Krispy Kreme Challenge in Raleigh. This is an event started a few years ago by NC State students. You run 2 (now 2.5) miles to Krispy Kreme, eat 12 doughnuts, then run back to the NC State Belltower. This year the event had 7,700 runners/eaters. It was a lot of fun, we started a few miles away from the start to turn it into a long run day. Here are pictures. 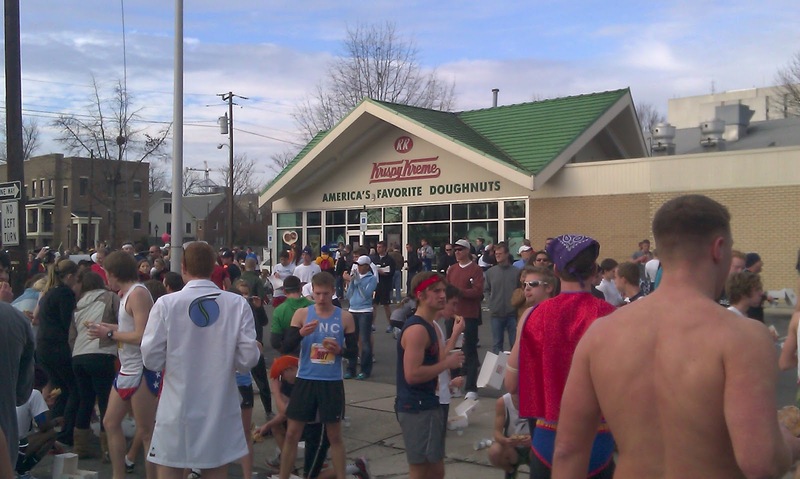 My time was a respectable 36:21, or about 7 minute / mile accounting for the doughnut stop. This put me into 10th place in the casual division. Yay for me! My season is complete! The winner, who ate all the doughnuts, finished in 28 minutes. Which is just sick on many levels.